Are You Paying for Traffic You Might Get for Free? As a consumer, free is the best price. As a marketer, free traffic is the best kind of traffic. We spend millions of dollars to get people to come to our website with the hopes that some of them will turn into paying customers. But often, the people that get to our website via other channels (free channels, for the most part) are “higher quality” leads. They come in through organic search results, or links from social media, or directly based on the recommendation of a friend or colleague. And because they took the impetus, they are often highly motivated. Sometimes, if we take the time to look, we end up spending our money to get some of these folks to come to our website, even though they would have come on their own otherwise. And while that might not necessarily make them less likely to convert, it does cost us money that we’d be better off saving, or investing elsewhere. Where Are You Spending Money Unnecessarily? The most common place we encounter this problem is on search engines, where companies spend money to target certain keyword phrases, with the goal of getting searchers to click on an ad at the top of the SERP. What most marketers fail to do is take their organic search rankings into account when deciding how to spend their money. For example, if you are already showing up in the first organic position on Google, do you really need to spend the money it takes to display your ad there? We know the value of the top position on Google. And if you’re already successful at winning traffic on that keyword, why spend any money at all? But Google is not the only place this happens. Companies spend countless ad dollars on banners, social media, billboards, television and radio that gets wasted on people who have already made their decision to purchase from you or not. In some of the more traditional channels, this is hard to avoid. But online, it’s not. The key to spending your money intelligently is to treat your marketing efforts more strategically. Each channel, each source, each campaign or effort or idea is just one part of the larger plan. Instead of putting them in siloes and assigning them to different teams, we must bring our teams together and approach the roles and responsibilities more holistically. SEM and SEO must be on the same page, so they don’t duplicate efforts and cancel each other out. Sales and marketing need to come together to make sure they’re not stepping on each other’s toes and sending the consumer mixed messages. The email team, or the social media team, should not be targeting introductory offers to existing customers. Stop spending money advertising to people you don’t need to. If you can figure out how to do that, you will suddenly free up a ton of cash you can put toward more effective means. And you will make your boss very happy. Ask any business with an online shopping presence what their biggest frustration is, and they’ll probably answer, “abandoned shopping carts.” In fact, there are far too many carts that get items added only to be left behind—and it can be difficult to determine why. The reasons for consumers abandoning a cart are many. They might be frustrated by the whole process and not want to set up an account. They might feel that there are fees that were tacked on the end that they weren’t expecting. Or they might just have gotten busy. But email is a good way to help those abandoned carts get active again. The trick is working out the timing of the email and the message must-includes, such as a clear statement about refunds. 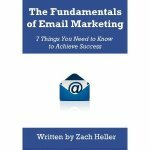 Want to discover how to craft those emails so they’re successful? Try the tips in this graphic. The ultimate goal of personalization as it relates to marketing has always been to individualize selling at scale. That is, we should be able to use technology to have one-to-one conversations with the entire possible market for our products. In email, we have always been able to personalize content to some extent. But it is no longer enough to insert your prospect’s name into a mass message. That used to pass for personalization. Now it looks like a cheap gimmick. Nobody really thinks Barack Obama took the time to write me an email, even though it begins with “Zach,”. The new rules of email personalization are more complex. In part, this is because the technology has advanced to the point that advanced personalization is now possible. And in part, this is also because smart marketers have led the way and shown what personalization at scale can look like. In marketers’ never-ending quest to improve conversion rates, it behooves us to better understand the expectations, the possibilities, and the potential impact of this new and improved approach to personalization. Personalizing content means writing for individuals rather than trying to craft a one-size-fits-all message that you send to your entire email list. It means tailoring a specific message that you expect to resonate with each subscriber or customer, based on what you already know about them. Let’s look at an example. Say you have a customer on your mailing list, Susan, who regularly shops with your ecommerce store. Based on the data you have collected, you know that Susan is a working mother of young children who does most of her shopping at the office. And in the past, she has responded to messaging around products and services designed to help simplify customers’ lives. You might tailor messaging to Susan that you know will resonate with her as a busy professional with demands on her time in and out of the home. This type of messaging might not be right for the rest of your mailing list, but for Susan it is more likely to lead to a sale. Whether you use different headlines, subject lines, imagery, or full body content, almost every email marketing platform today allows you to build customized content; essentially create different versions of your email based on any number of attributes in your customer database. We are past the days of sending the same mass discount email to everyone on your customer list. We know, because the data tells us, that different offers work to generate sales from different types of customers. That’s where personalized offers come into play. The aforementioned Susan isn’t a discount shopper. She is willing to pay up for products that truly impact her life. But maybe another customer on your mailing list, Marc, is more of a value hunter. He is looking for bargains, and is willing to wait to get a good deal. If your goal is to generate the as many sales as you can (and it should be) than there is no reason to send the same offers to both Susan and Marc. Instead, you can customize which products and services they receive emails about, and which promotions are made available to them. One of the biggest questions I used to get asked is, “when is the best time to send my emails?” In fact, it still is one of the more common inquiries I get. But the answer has changed over time. And now, the answer is simple. Send the email to each person when they are most likely to open it and take action. This is data you have if you’ve emailed these people before. A tool called Send Time Optimization comes standard with many email marketing platforms. It will send your email to each subscriber at a different time, based on when they have opened and clicked on your emails (and others) in the past. Even without this feature, you can segment your list in any number of ways for better timing – based on time of day or day of week demonstrated in past purchase behavior, by geographic location and time zone, etc. You no longer have to guess when your subscribers are most likely to respond to an email. You know.